Q&A with Ralph DeBerardinis, M.D., Ph.D., and Hao Zhu, M.D. Ralph DeBerardinis, M.D., Ph.D., and Hao Zhu, M.D., are the first two faculty members recruited to join Sean Morrison, Ph.D., at Children’s Medical Center Research Institute at UT Southwestern (CRI). 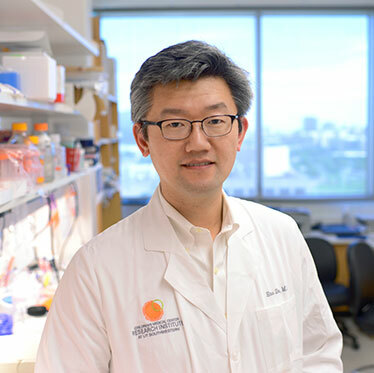 Dr. DeBerardinis, whose lab focuses on cancer and metabolism, and Dr. Zhu, whose lab focuses on liver cancer, recently discussed their reasons for joining CRI and what each hopes to achieve through their research in the coming years. What prompted you to join the faculty at CRI, and how has it met with your expectations? 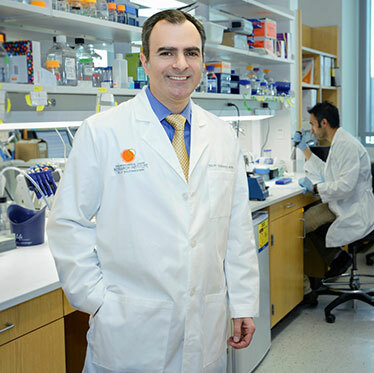 Ralph DeBerardinis, M.D., Ph.D. (RD): I had been on the faculty at UT Southwestern for four years, having come to Dallas from Philadelphia in 2008 to establish my own lab. When Sean [Morrison] was recruited in 2011 to establish CRI, it became clear to me that he was going to bring a tremendous amount of enthusiasm for cutting-edge, integrative research. There is certainly a lot of important research that follows the incremental path of the next logical experiment, but if you want to open entirely new fields, there has to be room for creativity and some tolerance for risk. The kinds of projects we discuss here are completely outside the box, not just in terms of biology but also in terms of technology. How can we do things in ways that are better, faster, more efficient, and that will also open up new areas of biology? That requires bold thinking, and that’s the kind of thing that doesn’t happen everywhere. A typical recruiting process for new faculty looks closely at an individual’s curriculum vitae to see how many papers have been published and in which journals. We consider those criteria, too, but we are also interested in the less tangible factor of creativity. We are most interested in individuals who have brought creative, fresh ideas to bear on fundamental biological questions. Collegiality and the potential for synergy are also important to us because of the integrative approach to research that we want to take. Hao Zhu, M.D. (HZ): I’m at an earlier stage of my career than Ralph. I was doing my oncology training at Dana-Farber Cancer Institute in Boston, pursuing a research track within oncology, and I was interested in how the formation of stem cells is related to the formation of cancer cells. When it was time for me to take the next step in my career, CRI clearly stood out as the best fit. Sean has a very clear vision for the direction of the institute, and I was confident that I would be working in a place with great people, very high standards and strong institutional support. Many in the scientific community right now are aiming to simply survive as investigators, and I knew that CRI was a place that had much bigger goals. I was looking for an opportunity to make a real contribution and do the best work that I could do, and I believe CRI is the best environment for that. The people here are top-notch, and they have the right idea about what constitutes good science. There is a real impulse to ask the significant questions about biology and medicine, and that helps me shape my vision for what I want to do. Talk about what you are hoping to achieve in your research at CRI, and why. HZ: For a long time, I have been interested in understanding how normal development and the normal function of genes and cells play a role in disease processes. One of the most intriguing normal functions of certain organs is the ability to regrow or regenerate after profound injury. I have a childlike fascination about that process — like when a newt or a starfish loses an arm and it grows back completely. That is a deeply interesting process. I want to pursue an understanding of how the liver’s ability to regenerate contributes to tumor formation. More generally speaking, how does injury cause cancer? And how does an organ with a potent ability to respond to injury promote or protect itself from cancer? We’ve committed ourselves to study those questions in the early stages of liver cancer, in order to identify the seminal events in tumor formation — since those are the events that need to be detected for diagnostics or attacked for therapy. One idea that I am interested in is whether particular genetic mutations in these highly regenerative liver cells cause a differential ability to respond to tissue injury. Do certain cancer-promoting genes confer a benefit during organ regeneration, and thus establish themselves within large populations of pre-cancerous cells when they outcompete other cells after injury? I believe those are deeply fascinating questions about a disease that is extremely relevant — it is the third leading cause of cancer death worldwide. Unfortunately, we still don’t understand the disease very well at all, either clinically or scientifically. Our options are limited at this time to removing the cancer surgically if we can get to it early enough, or treating it with local ablative therapies, but none of these modalities utilize or exploit a biological understanding of the cancer. Our best drug has a response rate of 2-3%. Unlike breast cancer, where we can now subdivide the cancers into several different types that allow us to treat a patient accordingly, with liver cancer we don’t even routinely perform biopsies. Given this state of affairs, I think we are poised to make fundamental discoveries that may immediately influence clinical practice. RD: My primary area of focus is metabolism, which I first became interested in as a clinician seeing pediatric patients with genetic metabolic diseases called inborn errors of metabolism. I spent my postdoc working on how we can better understand how metabolism is regulated at the cellular level. There is a metabolic challenge in rapid cell growth, for example, because all components in the cell need to be built and rebuilt every time the cell goes through the cell cycle. That requires energy and orchestration of many individual metabolic pathways so that the cell can be built exactly the right way every time. Prior to joining CRI, I developed methods to study those processes sensitively and accurately in cancer cells, which have genetically programmed changes in metabolism that allow them to grow abnormally well. The goal of my lab is to understand every metabolic pathway that goes awry in cancer cells and to understand what benefit each pathway provides for the cell. From that information we’ll do two things: improve the way we diagnose cancer by developing imaging techniques that will illuminate informative aspects of metabolism in a tumor as it is growing in a patient; and develop therapeutic agents that will selectively manipulate the metabolism in the tumor to reduce its growth but not disturb the metabolism in the rest of the body. In the research we’ve conducted to date, we have found there is a tremendous amount of variability in the choices that cancer cells make in terms of which metabolic pathways they’re going to turn on and which they’re going to turn off. We think all of that is regulated by the combinations of mutations that cancer cells acquire on their way to becoming a tumor, and what we’re trying to do now is decode that complexity so we can understand which combinations of mutations cause a cancer cell to use a certain pathway. If you can reverse that choice, you may be able to suppress the growth of the cancer cell or kill it, and do so without affecting the metabolism in the rest of the body. When did you first know you wanted to pursue this profession? HZ: I have been fascinated with biology and science since high school, and I worked on a lot of different types of projects, but I also was very interested in the medical aspects of what I was doing. During medical school, I worked on zebra fish blood development and how it relates to disease processes. At that point, I knew I had to pursue disease-inspired research. I still love seeing patients, and I will begin seeing patients at Parkland Hospital next year, but I also know that I will always be most passionate about going back to the bench in order to understand something more about diseases and how to treat them. RD: I came from a large Italian family with a father who was the youngest of six and the only one to go to college. I was interested in biology from an early age, and I liked the idea of helping people, so I went to college to get a degree in biology and then go to medical school. While I was in college at Saint Joseph’s University, I had the opportunity to work in the lab of a Ph.D. microbiologist named John Tudor, and I became hooked on research. From that moment, I knew I wanted to become both a scientist and a physician. What lessons have you learned along the way that might benefit others pursuing a career in science or medicine? RD: Our collective knowledge of biology is still fairly rudimentary, so I have learned that you have to love the science more than you love the hypothesis, because chances are the hypothesis is going to be wrong. You have to be able to find satisfaction and derive rewards from doing a well-designed experiment that disproves your hypothesis, because that’s progress. HZ: I’ve learned that the best thing you can do is surround yourself with the best people you can and learn from them. Allow those people to help you mold your vision for what you want to do and help you set expectations for how you engage in your work. I also believe it’s important to find a place where you can be bold enough to ask the profound questions within science and medicine, because if you don’t, you won’t ever get profound results. That approach certainly sets the tone here at CRI.